If you’re new to the restaurant business, no doubt your head is swimming with all the different rules and regulations you’ll have to comply with. Ensuring fire safety in the kitchen is just one of the many issues you’ll need to deal with. Besides investing in the right fire safety equipment like portable extinguishers and automatic fire suppression systems, you’ll also need to get regular kitchen exhaust hood cleanings in Los Angeles CA in order to satisfy the safety inspectors and keep your kitchen open for business. Kitchen exhaust hood cleaning Los Angeles CA helps reduce the risk of dangerous exhaust system fires in commercial kitchens. If the exhaust hood and ducts are not cleaned regularly, vaporized grease released during cooking will start to accumulate on their interior surfaces. Eventually a thick layer of grease can build up, resulting in a smelly fire hazard. If the grease becomes superheated, it can catch fire and cause a great deal of damage. Kitchen exhaust system cleaning removes these dangerous grease deposits, thus eliminating the fire hazard. Different types of restaurants will require more or less frequent exhaust system cleanings based on the type and volume of food that they prepare. For example, a fast food restaurant that does a lot of frying generate plenty of vaporized grease, while a vegan restaurant that doesn’t cook meat or serve many fried foods will not experience rapid grease buildup in the exhaust system. In general, a commercial kitchen should get their exhaust hood scraped clean of grease every 4 to 6 weeks. 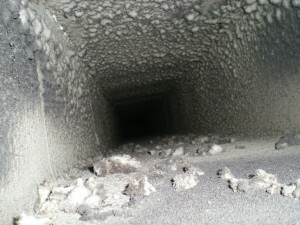 This should be supplemented with a thorough steam cleaning of the deeper regions of the ductwork 2 to 4 times per year. When getting a kitchen exhaust hood cleaning Los Angeles CA, your best bet is to choose a well-established company that employs fully trained and certified technicians. This way, you know that the job will get done right, and you don’t have to worry about the technicians doing a sloppy job or just cleaning the parts of the hood you can see easily. Look for a company like Flue Steam that is a member of IKECA (International Kitchen Exhaust Cleaning Association). Membership in this trade organization signals that the technicians will hold the necessary certifications. IKECA certifications must be renewed periodically through the completion of continuing education requirements, so you know that the technicians from an IKECA member company will be totally up to date on the latest exhaust system cleaning rules, regulations, and techniques.